We offer platinum laboratory tools that are chemically stable and have an excellent weight consistency in air and under high temperatures. These laboratory tools are highly reliable under high temperatures or when used with acid or alkaline chemicals. High-precision processing enables us to deliver high-quality products in a short lead time. In addition, we have improved our lineup of peripheral tools, such as platinum tongs. 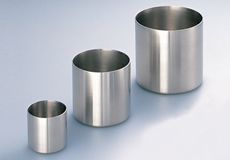 Platinum crucibles and jigs for single crystal growth are also available in various sizes. Laboratory tools can be delivered in a short lead time thanks to the use of dedicated collection lines and machining equipment. Our standard products can be delivered as quickly as within one week after order placement. 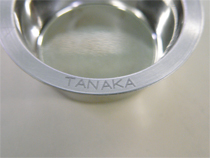 Marking is possible almost anywhere on the product thanks to the use of laser markers (font size from 1.5 to 55 mm). 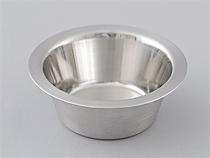 Reduced variation in wall thickness thanks to high-precision processing (bead dishes). Improved surface condition is possible by changing from conventional manual grinding to mechanical grinding (bead dishes). 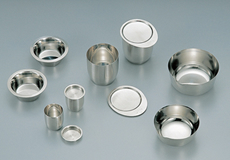 Laboratory tools are available in various other alloys in addition to platinum. Laboratory tools of various shapes and sizes are available upon request. Bead wall thickness distribution graph plots the mean values of measurements along 8 lines obtaind by dividing the product into 45° segments. Other tools used for analysis, such as platinum boats, tongs, and tools for heat analysis are also available. Tools of various shapes and sizes are available upon request. E.g. : LPE board holder, Cz seed holder, etc. We can offer flexible solutions for materials depending on your requirements. Case Study:End-customer complained about a drop in precision of component analysis. Case Study:Didn’t want to stock high cost products but wanted to be able to meet sudden orders.